Following a successful run at off-Broadway's Atlantic Theater Company in fall 2016, David Yazbek and Itamar Moses' musical adaptation of the 2007 israeli film "The Band's Visit" arrived on Broadway with its original stars Katrina Lenk and Golden Globe and three-time Emmy Award winner Tony Shalhoub. Perhpas the most hyped Broadway opening of fall 2017, The Band's Visit is simply unlike anything else on the Great White Way. As the musical begins, a projection tells us that “Once not long ago a group of musicians came to Israel from Egypt.” A second projection then reads: “You probably didn’t hear about it. It wasn’t very important.” And with that, we are gently lulled into 90 minutes of a story where, as those self-deprecating words predict, nothing truly important happens... And yet, everything that could happen in a group of characters' lives, does happen. 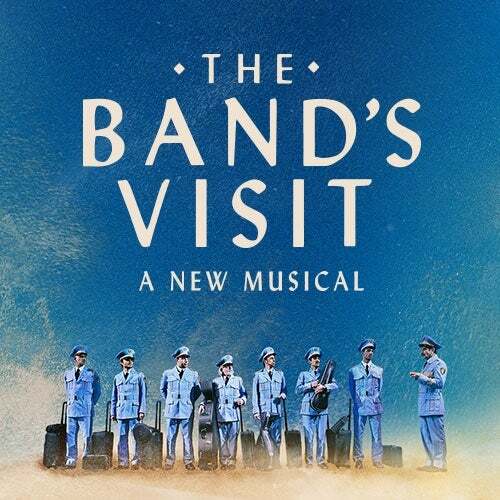 The Band's Visit is about a meeting of two groups of strangers, brought together by a simple mishap. Instead of ending up in the bustling city of Petah Tikva in Israel, an Egyptian police band accidentally end up in the small, isolated town of the similarly-pronounced Bet Hatikva and are taken in by the locals for one night. Although the setting is the catalyst for David Yazbek's beautiful, Middle Eastern-infused score, you could pick this story up and place it in any isolated town or village anywhere in the world. It is this universal aspect to the story that audiences are connecting with. A small, "unimportant" story is speaking volumes about humanity and how we can form bonds with those we usually wouldn't encounter in our regular lives. How do we overcome our loneliness? How do we re-connect with our estranged loved ones? The cast is filled with talented actor/musicians who are often omnipresent on stage, blurring the lines between musical numbers and scene changes, creating quite the non-traditional musical in the process. The captivating leading duo of Dina, a café owner in the town, and Tewfiq, the band's conductor, are worlds apart in their manners and sensibilities and yet set a story in motion that has us crying out for a sequel. The Band's Visit is the runaway hit of the 2017-2018 Broadway season. But unlike the short, overnight stay depicted in the musical, this band has visited the Barrymore Theatre and they are here to stay. An Egyptian Police Band arrives in Israel to play a concert. After a mix-up at the border, they are sent to a remote village in the middle of the desert. With no bus until morning and no hotel in sight, these unlikely travelers are taken in by the locals. Under the spell of the desert sky, their lives become intertwined in the most unexpected ways. The Band's Visit celebrates the deeply human ways music and laughter connect us all. Orin Wolf, John Styles and John N. Hart, Jr.
Last night The 61st Annual Grammy Awards were held at the Staples Center in Los Angeles and it was good news for the 10-time Tony Award-winning "Best Musical" The Band's Visit, as the production added yet another trophy to its overcrowded mantelpiece. Producers of the 10-time Tony Award-winning "Best Musical" The Band's Visit have now posted a Broadway closing notice, with the production playing its final performance at the Barrymore Theatre on April 7, 2019. Upon closing, it will have played a total of 36 previews and 589 regular performances, and the musical was able to recoup its $8.75 million capitalization in September 2018. On the Opening Night of the Broadway premiere of The Band's Visit we caught up with the show's leading man - 3-time Tony Award nominee and 3-time Emmy Award winner Tony Shalhoub. The band has visited and it's safe to say that it has made a huge impact on the 2017-2018 Broadway season. In fact, at this early stage, I would even go so far as to say it may well be a frontrunner for next year's Awards Season. But before we get ahead of ourselves, let's first celebrate the Opening of The Band's Visit on the Great White Way.